The Chicago event was outside a sold-out Soldier Field. Still no press credentials so we couldn’t shoot any of the game play, but a very busy footprint made for a very fun day. 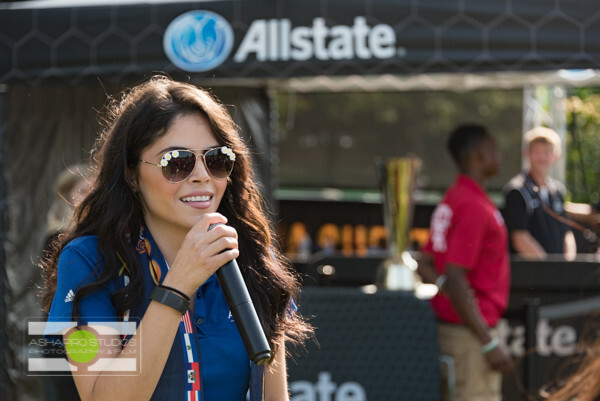 This is a great time to walk through the activities fans can participate in with my client – Allstate – when they get to the fan village outside a CONCACAF Gold Cup match. First, there’s a Street Team. This is a group of ambassadors that are roaming around – parking lots, fields, stadium entrance areas, etc. As you speak with them, they ask you to complete a form, and in return you’re given 2 things – an Allstate CONCACAF Gold Cup scarf, custom-made for this run, and a 2-part enter-to-win ticket. As you approach the Allstate footprint, the next thing you see are 3 pavilions, each staffed with more ambassadors doing the same thing that the Street Team is doing, along side local Allstate agents. Once you have your 2-part ticket, whether from the Street Team or the pavilion, you take one side inside the footprint. There’s a large backdrop with a tumbler; your prize entry goes in and there are drawings to win prizes. Autographed jerseys, upgraded game tickets, and sometimes suite access. One side has a modified photo booth. In the US, Allstate has been running a “Mayhem” campaign. 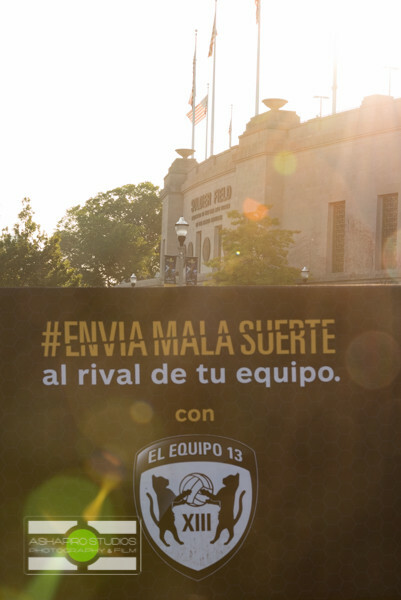 In hispanic markets, that campaign is known as “Mala Suerte,” or ‘Bad Luck.’ Tying in to their sponsorship of Mexico Men’s National Team, my client is using the hashtag #EnviaMalaSuerte, or ‘Send Bad Luck’ to your opposing team. The face of the Mala Suerte campaign is an actor named Alberto Mateo. This pavilion features a backdrop with several images of Mateo that soccer fans can stand ‘with,’ then that photo is sent to your phone or email. The other pavilion features a soccer legend – a former player who’s on-site to talk to fans and sign autographs. In Dallas we worked with Brian McBride from Team USA; in Houston, Chicago and Phoenix we worked with Adolfo Rios, legendary goalie for Mexico. 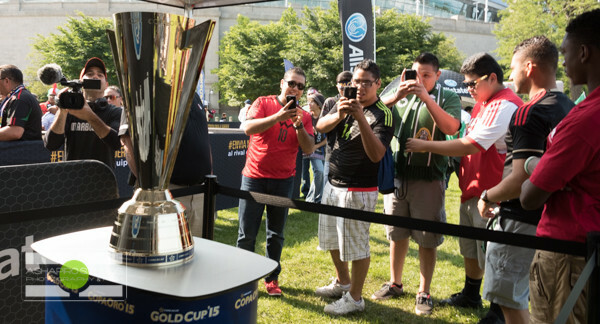 Also onsite is the CONCACAF Gold Cup Champions Trophy, which fans can take pictures of and with, and the whole thing is hosted by an MC who keeps the energy up, engages with fans, holds the drawings… ya know, MC stuff. 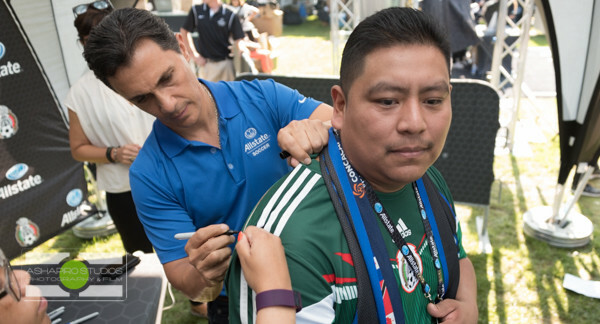 All of this is inside a Fan Village that features other sponsors… Jarritos and Sprint also have decent presence, while we’ve also seen radio stations, food trucks and more. Put all of this together and… we were mobbed. From the moment the Fan Village opened until just before game time, Chicago couldn’t get enough. Entries for the sweepstakes were jammed, Adolfo had to extend his time with us… It was great. Better yet, the weather was perfect. After the rain storms in Texas and the heat that was to come in Phoenix, mid-70’s with a light breeze and a few puffy clouds were on point. 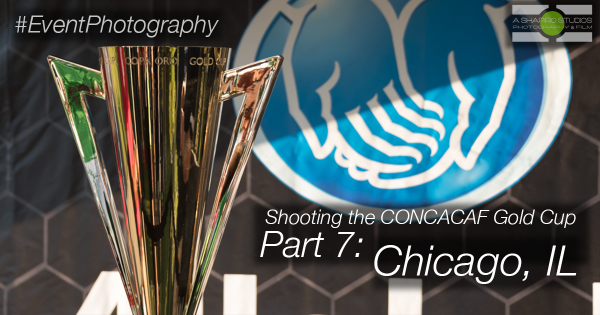 See the entire collection of event photography from the 2015 CONCACAF Gold Cup in Chicago, IL here, and on to Phoenix!